This page will share partition magic to resize hard disk when Windows Server 2003 needs free space on system partition or other partition. Download IM-Magic Partition Resizer Server to reallocate disk space on Windows Server 2003 when it is running on low disk space. C drive too small? 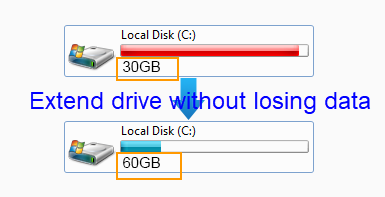 E or H drive still has many free space? Do you want to add some space to c drive without formatting disk or reinstalling OS? This can be possible with a magic software : IM-Magic Partition Resizer Server works on Windows Server OS that could let you add more space to c drive with 100% OS and data untouched. Download&install, right click the one which is large. Move the free space to drive when it needs more space by "Resize/Move" option on the software. Some problem we may encounter on Windows Server 2003 is the low disk space of disk partition, so we will discuss the problem and solution for low disk space fixing on Windows Server 2003. "I have a 20GB C drive that is nearly full on Windows Server 2003. System suggests me to delete some old files to free up space, but it does no help. Diskpart command also failed to extend the C drive because it says the selected drive cannot be extended. Is there any other way to fix the problem when Windows Server 2003 C drive is running out of disk space?" "I need some free space on Windows Server 2003 system partition, because there is only a few MB available space on this partition. If possible, I want to move some free space from D drive to the system partition. But I don't how to do it. Can anybody tell me the way to move free space from D drive to C drive on Windows Server 2003 without touching original data? Or is there any other way to extend C drive on Windows Server 2003?" 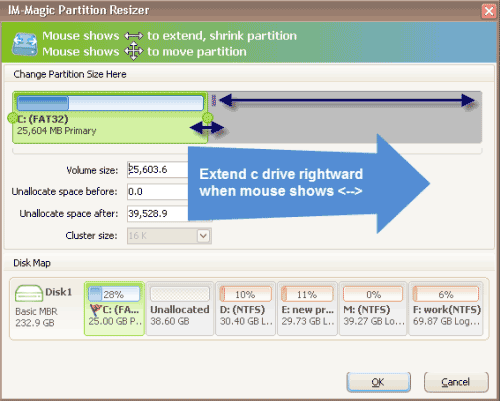 Diskpart cannot extend an FAT32 partition no matter it is data partition or system partition. What can we do? IM-Magic Partition Resizer Server can extend FAT32/NTFS system partition and data partition without rebooting your PC or reinstalling operating system, so it is easy-to-use and time-saving to use this software to fix low disk space problem when Windows Server 2003 needs space.